It's no surprise that marketers are talking more about revenue now than ever before. As they are increasingly being asked to "take a number" in their organization's revenue projections and plans, they are facing a chasm between where they are today in terms of revenue performance, and where they want to be. This is revenue gap--and trying to close it is what's keeping marketers up at night. 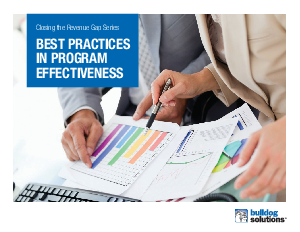 This executive overview focuses on one of these drivers--program effectiveness--defined by leading marketers as programs that drive a high level of conversion and prospect engagement throughout the buyer's journey. In this executive overview, we'll take a look at the current buyer landscape, and then at five best practice areas that need to be optimized in order for your programs to reach their full potential.